These are tiny cameras that record and store whatever you see, and even play it back before your very eyes. Our memories are fallible things. We remember something one way; but the reality can be quite different. But imagine contact lenses that are also tiny cameras, recording and storing whatever you see, and even playing it back before your very eyes. What was really said at last week’s meeting? Play it back and see. Want to cherish forever some treasured moment—when you first saw your future spouse, or the birth of a child, or some other formative event? You may be able to soon. And it gets better. Imagine how it might change the criminal justice system, with such infallible eyewitnesses. Grandpa has an incredible Bigfoot, ghost, or UFO story? Maybe all three? Let’s see the playback, Gramps; let’s see the proof. It’s an intriguing concept, and a little frightening. And now, Sony is muscling its way into a game that already boasts such heavyweight players as Google and Samsung. The company has filed a patent for a “smart” contact lens—and it’s pretty cool stuff. A key component of the new contact lens technology is that the camera recorders “know” when you’re deliberately blinking, as opposed to the natural, involuntary blinks; these deliberate motions activate the mechanisms of the camera. What happens when you fall asleep? Rest your eyes for a few seconds? There are issues to be worked out, certainly, but it’s still a fascinating concept. 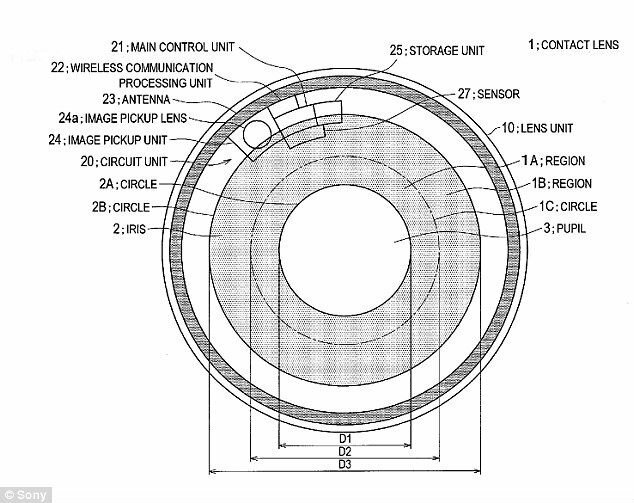 Another exciting development is that the lenses record images to an internal storage device—a big improvement over other designs, such as Samsung’s, which would transmit images to an external device. It means you can easily and quickly access your recordings. The lenses will feature a suite of sophisticated technologies. They’ll use piezoelectric sensors, which convert mechanical energy—pressure, force, etc.—into electrical energy; eye movements, therefore, will be read by these sensors and used to activate the camera or recordings. Power will be supplied by electromagnetic induction, in which a slight electrical current is produced by moving a conductor through a magnetic field. It’ll even be able to adjust for the tilt of a user’s eye, and use autofocus for blurry images. The technology is all very theoretical and avant-garde right now, but with so many tech companies scrambling to develop and patent the necessary devices, we can probably look forward to seeing these “smart” lenses very soon.